This October saw Nu-Heat staff ‘dress down’ and up (!) 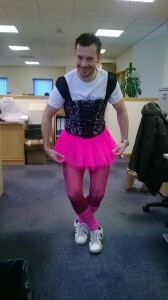 in pink attire to fundraise in aid of Wear It Pink. “When you join the hundreds of thousands of people who take part in wear it pink, you become part of a collective force of scientists, supporters and people affected by breast cancer. Together, our mission is to beat this disease by funding ground-breaking research,” Wear It Pink. Learn more about the research made possible by donations on Breast Cancer Campaign’s website.